Last Day on Earth: Update 1.11.2 – Hazmat Suits + New Sector 7 Mission! Survivors! Update 1.11.2 is now available for both IOS and Android users! This update focuses on bringing more interactive play into Sector 7. There are 2 new types of enemies, Ashy Zombie and Ashy Runner. There is also now lootable chests in the Infected Wasteland (The only travelable zone past Sector 7). Finally, they have added a new weapon called the Revolver! Martial law in sector 7. The zone is filled with Ashy zombies. In fights your power armor got damaged, you’ll need a hazmat suit. On the location Infected Wasteland you can find first-aid kits, old revolvers, and parts of Hazmat suit. The required items to open the Gateway Door to unlock sector 7. This update focuses on bringing more interactive play into sector 7! Sector 7 is an unlockable location requiring a variety of resources to unlock. It is currently the only location where you can encounter other players and allows some form of multiplayer. This update is the first of its kind to allow players to bring objects into sector 7. Currently, these objects are limited to The Revolver, Bandages, and Hazmat suit pieces. This update also brought 2 new sector 7 exclusive enemies; Ashy Runner and Ashy Zombie. They have 80 and 40 HP respectively and deal 5 damage to a player wearing full hazmat armor. The Hazmat Suit, on a player showing the suit’s stats and appearance. The Infected Wasteland now has radiation! You can still enter the location without any protection, but beware! Anyone who enters the location without wearing radiation protection (Hazmat Suit) will take damage. A player without a Hazmat Suit will take 4 damage every second due to the radiation. You can obtain one full durability Hazmat Suit in the Sector 7 lobby on a conveyor belt beside where you receive your missions. You can also find other parts of the suit (with less durability) in chests in the Infected Wasteland or off fallen player bodies. The Hazmat Suit contains four parts, the helmet, chest piece, pants, and boots. Combined, the set provides full protection from radiation, a defense rating of 10, and a movement speed of 40. 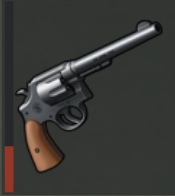 The Old Revolver is the newest weapon to be added to LDoE. Currently, it can only be found in the Infected Wastelands area as a common drop from chests, or a rare drop from killing Ashy Zombies or Ashy Runners. The item is uncraftable, and can only be found in locations. It deals 16 damage per shot, and has an attack speed of 0.8 making its damage per second 20. This places it as a lower tier firearm, but still effective against many enemies. It is currently the only weapon that can be found in Sector 7, making it the most efficient way to kill enemies past the Sector 7 wall. With a new sector 7 update comes a new sector 7 mission! This mission requires you to travel to the Infected Wastelands to kill 10 Ashy Runners, 20 Ashy Zombies and Open 1 Chest. These missions are relatively easy, and can be completed in just a few minutes. It is important to take a Hazmat Suit with you for this mission, as the environment is radioactive and will deal damage to you without it! Not to worry, in the Infected Wasteland you can find everything you need to complete the mission. In chests, or drops from fallen zombies you can find Bandages, Old Revolvers, and Hazmat Suit Pieces. For completing this mission, you get the same reward as always; “Increased chance to inflict critical damage with firearms”. This buff lasts for 1 hour, and can only be obtained once per day, so it is recommended you use it wisely! A few new things have been added / changed this update! In the Sector 7 lobby you can now find a chest which allows you to store 5 items. This may seem very unimportant, but it could hint at multiplayer storage at clan bases! There was also a new conveyor belt added next to the mission terminal. Currently this only dispenses Hazmat Suits, but this opens up the opportunity for therm to provide us with more equipment or even new rewards for completing a mission! The power armor suit now displays that it is damaged. We can no longer wear the armor, which tells us that eventually we will have to repair the armor to wear it. Lastly, an important change is that with the addition of chests in multiplayer locations, we cannot place items in the chest. This shows us that Kefir has no intention of adding resource sharing through multiplayer locations any time soon. Multiple players can open a chest at once, hinting that there may only be set rewards per zone!